Field Programmable Gate Array (FPGA) Market size was valued at USD 5.27 billion in 2014 and is expected to grow at a CAGR of 8.4% from 2015 to 2022. Increased demand customizable ICs coupled with rising demand from application areas is expected to propel the industry growth over the forecast period. Technology innovation is likely to be the driving force behind field programmable gate array market share growth. These products are reprogrammable and can be modified to implement the required functionality in terms of hardware. Additionally, the use of these products helps customized circuit construction at lower prices, this helps them function as fully customized microprocessors. Use of these products across a host of end-use industries is anticipated to fuel field programmable gate array market share growth over the next few years. These devices have built-in RAM, which operate as a system CPU and performs Digital Signal Processing (DSP) functions such as signal processing and image enhancement in smartphones. They are used for a range of purposes in flat panel displays including panel driver or controller, video processing, display panel application, operating mode and video board, and battery management. It is also deployed in the healthcare sector for medical imaging equipment owing to need for high performance computing. General diagnostic imaging devices comprise CT scanners, mammography equipment, X-rays, MRIs, ultrasounds, and nuclear medicine imaging. The benefits offered in digital signal processing over other processors makes it a feasible substitute for most equipment comprising volume imaging conducted in CT and PET machines. Design complexity and threat of ASIC as substitute are anticipated to hinder growth over the next seven years. 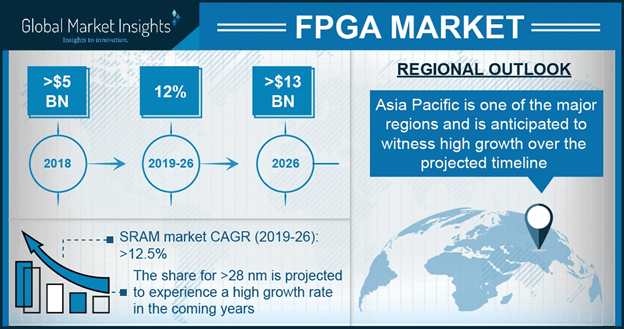 Rising popularity of medical electronics along with increasing demand from Asia Pacific is expected to and offer potential growth opportunities to FPGA market participants over the forecast period. Telecom sector accounted for more than 33% of the overall field programmable gate array market share in 2014 and is expected to continue its dominance over the next seven years. This can be mainly attributed to high bandwidth demand for video applications. Increasing usage in base stations in updating from 3G to LTE networks is also likely to surge the demand. Moreover, operators are turning towards green solutions to reduce energy-related expenses and increase overall operational efficiency. Increasing number of ICs in the average car is expected to be the key driving force for the automotive segment. In addition, favorable regulatory norms for electric as well as hybrid vehicles to reduce carbon emissions are expected to positively impact demand. It accounted for over 17% of the total field programmable gate array market share in 2014 and is anticipated to grow at a CAGR of over 8.5% from 2015 to 2022. Asia Pacific field programmable gate array market size was valued at around USD 2.1 billion in 2014 and is expected to exceed USD 4.2 billion till 2022. This is due to the presence of countries such as China, Japan, South Korea, India, and Taiwan, which contribute significantly to consumer electronics and automotive consumption. U.S. FPGA market share accounted for over 25% of the total revenue in 2014. Heavy investment for military and aerospace applications, and telecom application development is expected to drive regional growth over the forecast period. Xilinx Inc., Altera Corporation, and Lattice Semiconductor are the leading manufactures and accounted for more than 80% of the global field programmable gate array market share in 2014. Other companies include Tabula, Microsemi Corporation, Achronix, QuickLogic and Cypress Semiconductors. Key industry participants market their products directly, as well as through electronic component distributors and independent sales channels.